The sentence illustrates the PP’s electoral strategy. The once mainstream center-right party is nowadays running on a much thinner, essentially conservative platform. “We have done what was required, but now it is not the right time to ‘experiment’” seems to be the motto of its campaign, which squares well with the following fact: 50% its current supporters are retired people. These mostly come from traditional middle classes that have risked little in the current crisis. Therefore, the PP is now located at the very extreme of the three most salient cleavages in Spanish politics nowadays: left-right, reform-status quo, and centralism-decentralisation. In sum, the PP is betting all in on economic recovery to get a grip on people’s changing voting patterns. However, the narrative has some fundamental problems. First and foremost, unemployment remains the single most important worry among the vast majority of the population. The youngest workers have been particularly affected by the crisis, especially in terms of structural unemployment. This is not so much because the unemployment rate amongst young people is unusually high when compared with the overall rate, but because most of these people will have a hard time getting back to work. It is not only young people who have been affected by long-term unemployment. At the moment, more than three million Spaniards have been looking for a job for over a year. These individuals are likely to hold skills that are of little value to the market, and therefore need some sort of way out of their current situation. 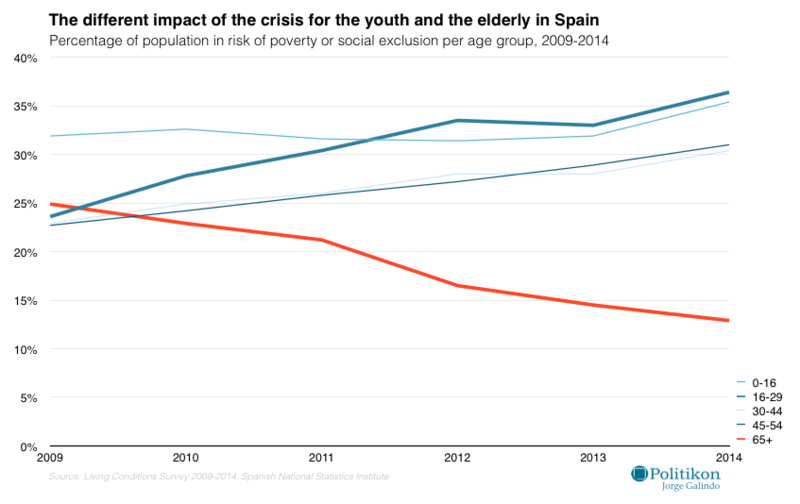 As a product of structural unemployment, the lack of welfare mechanisms that properly cover up for the risk of household income loss once the business cycle goes south, and a number of other variables, the risk of poverty or exclusion is on the rise for most people in Spain… except for the elderly, whose risk profile has actually improved during the crisis. This is a consequence of both the disproportionate effect of the recession on employment and the functioning of the Spanish welfare state, a good system to protect older cohorts but relatively inefficient to provide a safety net for the younger. Inequality is one of many structural problems that have not been decidedly tackled by the current government. Despite enjoying a wide majority and holding the power in most regional governments, the PP has not addressed several aspects that have been pointed at by economists and international organisations as important bottlenecks for sustained growth, including (but not limited to) labour market dualisation; education and human capital formation; and energy provision. Not all caveats to the ‘success narrative’ are strictly economic. Corruption and the subsequent discredit of the political elite are far from disappearing from the agenda. 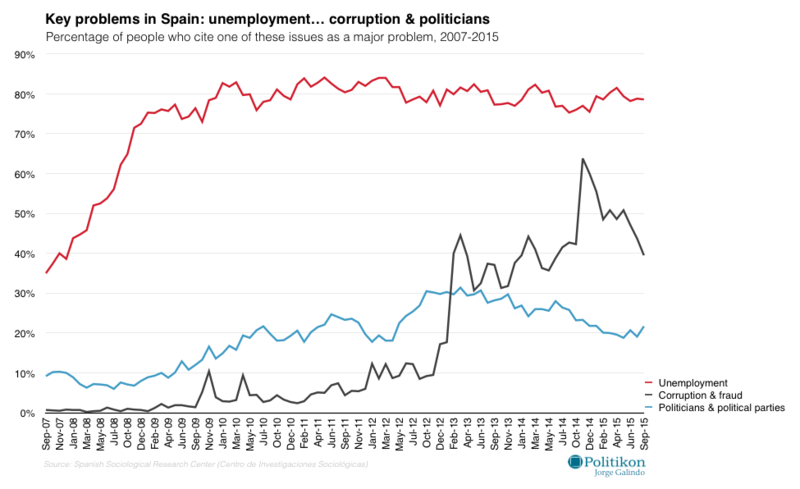 Even when (as seen in the first graph) the degree of worrisomeness on the issue of corruption is slightly decreasing, it remains as a chief problem for many voters. Last but not least, Catalonia is in a stalemate. The recent election confirmed that the region is split between pro and anti-secession sentiment almost 50/50 (47%-53%), but the latter got the majority of seats by a slight margin. There is a new parliament, but not new government has been elected yet since the key partners of the moderate secessionist block (‘Junts Pel Si’) is a radical left platform who wants independence but does not want current President Artur Mas as a leader, and is not willing to give its vote to him. Corruption allegations are spreading. Neither Madrid nor Barcelona have any incentives to enter into talks before the general election gives a clearer idea of who is going to be in office to negotiate. Meanwhile, the division in both camps is becoming more evident: cracks are appearing on the secessionist façade, but the legalism and immobilism from the PP is not well regarded by everyone either. All these factors constitute the challenge to the governing party, and delimitate the debate in the campaign. As an incumbent, the PP has chosen not to develop a more reformist discourse. Therefore, the space of change is to be filled by someone else. The PSOE, along with other minor parties, has been the traditional alternative to the PP, but the emergence of two new formations (Podemos and Ciudadanos) shows that for at least 30% of the voters (according to the polls) did not find the socialist option to be suitable this time. For the last year and a half the PSOE has been trying to build a new platform, but with little success. 40% of its current supporters are out of the economically active population. It has the highest presence of unionised workers and retired working class. Moreover, its voters have the lowest income profile. Putting forward a set of reforms that suit both the biggest losers from the crisis and the relatively sheltered elderly is proving quite difficult, especially under a heavy budget constraint that does not allow to put money anywhere without carefully explaining where would it come from. In this context, the PSOE has to face two different challenges, coming both from its left and from its right. Podemos has followed a rollercoaster-like path in the last year. According to polls and expectations, Pablo Iglesias’ party has traveled from a Syriza-like phenomenon to something more akin to a classic New Left party. Its supporters are younger than the average, significantly more educated and, in some cases, overqualified (12.6%, more than for any other party). The initial rise to the first position in many polls by the end of last year has come to an end due to several reasons, wonderfully summarised by Pablo Simón. Two should be underlined: first and foremost, their attempt to overcome the traditional left-right cleavage and to collapse all the dilemmas faced by Spain into a single dichotomy between them and the establishment has been clearly unsuccessful. According to polls, voters do not hesitate to place Podemos at the left of the ideological scale. The incapacity of their leaders to take a stronger position on several issues has come at a cost. Their failure to meet expectations in the recent Catalan election is a paradigmatic example: Podemos has not been able to place a clear, appealing message in the center-periphery axis. Nonetheless, the old-new axis was definitely activated by them, but here comes the second crucial barrier for Podemos. The appearance of Ciudadanos at the national level and the (rather timid) moves of the PSOE toward renovation have stolen its thunder, and now they meet competition on the new side of politics as well. Ciudadanos is a party with a much more moderate, reformist base. Coming from an implicit coalition between Third-Way social democrats and right-leaning liberals, its most distinctive voters are relatively young managers, high-level employers and highly-educated workers. The need for more and deeper reforms summarizes its essence, along with a strong preference against Catalan secession (but nonetheless openess to negotiate with Barcelona since the origins of the organisation are actually in Catalonia: it was a regional party until a year ago). Using a parodic image, the party looks a bit like a bunch of OECD recommendations running for elections but having as well a clear interest on maintaining Spain united. It is therefore positioning itself on a rather centrist (and centralist!) ideological area. The choice is both appealing and dangerous. By definition, the center is the best position to reap votes, but it is also where the highest level of competition is faced. Having apparently exhausted its capacity to get new voters from the PP ranks and with no challenge coming from the right any more given its conservative discourse, now it seems like several moderate social-democrats are considering to give them their support. According to an official poll made in July, 35% of its supporters would prefer a PP-C’s coalition from 2016 on, but 37% would go for a PSOE-C’s alternative. As the left-leaning join the party, a coalition with the PP is both easier (since they stop ‘stealing’ votes from the conservatives) and more difficult (as it would become the least preferred option of its voters). At the regional level, C’s has given support both to the socialists and to the right wing. But now they would be forced to choose.